© Copyright 2005 digLloyd, Inc. Depth of field is a function of aperture and shooting distance. It is also a function of focal length, but this effect is minimal except when doing close-up work. When depth of field is described, it is in relation to a circle of confusion, the smallest dot that is considered "sharp". A discussion of depth of field or a depth of field table is misleading without also stating this circle of confusion, unless it is a relative comparison, as this discussion is. 1. You can move farther back. This expands the field of view and changes the perspective (relative size of items) in the picture. You crop the resulting image to the original composition. 2. You can keep the camera in the same position and use a shorter focal length. This expands the field of view, but the perspective (relative size of items) remains unchanged. You crop the resulting image to the original composition. Using the D2X, the crop described in (2) is always done by virtue of its smaller sensor, which is just 2/3 the size of the full-frame 36mm X 25mm sensor used in the 1Ds Mark II. Look at the examples, then see the conclusion at the end of this page for how this works out in practice. All shots D2X on the left, 1DsMII on the right. These are the full-frame image (not crops) downsampled but not sharpened. If you have Adobe Photoshop, open the larger, layered TIF (15MB) file to make it easier to see the differences. In the TIF file, by clicking layers on and off, you can conveniently compare the D2X to the 1DsMII and/or the same camera at different apertures. Now let's examine some actual-pixels crops at f16 from each camera (D2X images were upsized to match). The D2X image is on the top and the 1DsMII image is below it. Note that both cameras lost highlight detail. Identical exposures were used, but it appears that I slightly overexposed the 1DsMII shot. However, that does not invalidate the depth of field comparison. The focus point was near the top green leaf. 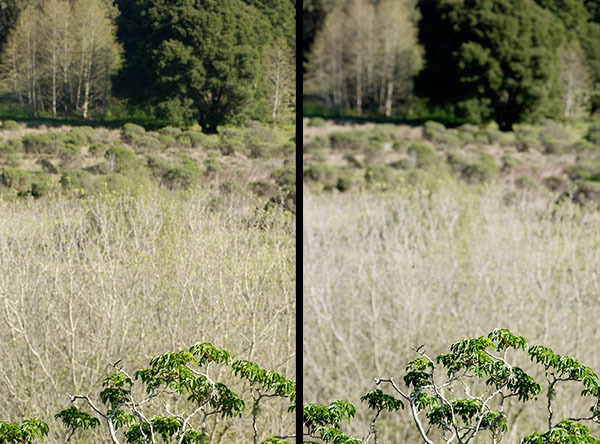 The 1DsMII does appear to resolve slightly more detail in the leaves than the D2X does. Sharpening would narrow this apparent difference. But the compelling observation here is that there is a far larger difference in the sharpness of the area beyond the focus point. At a minimum, the D2X has a depth of field advantage of one and one third stops. If you are shooting where significant depth of field is required, the D2X will better serve your needs, producing more sharp pixels overall than the 1DsMII. Or, the D2X will be able to shoot at a higher shutter speed while obtaining the same DOF. When the wind is blowing, details like leaves or flowers can be obliterated by a too-low shutter speed. When it's dusk, you may not be able to stop down to get DOF and still get a fast-enough shutter speed. You can raise the ISO on the 1DsMII, but that degrades picture quality. And in these examples, even f16 was not enough to make up for the disadvantage. Going beyond f16 on either camera seriously degrades overall image sharpness and contrast, though in this case perhaps it would be an improvement for the 1DsMII. If your photographs involve selective focus such as head or torso shots of people with a pleasantly blurred background, you will be better served by the attractive background blur of the 1DsMII. The Canon 85/f1.2L and the discontinued and exceedingly rare 50/f1.0L are in a class by themselves in this regard and can't be matched on a Nikon body. However, in practice I've found that on the D2X I can achieve very pleasant background blur with a number of lenses, including the 50mm/f1.4, the 35mm/f1.4, the 70-200/f2.8VR, the 85/f1.4, the 200VR and others. The complete review contains a page demonstrating the background blur from each camera. Depth of field is not a fixed property of aperture and focal length. It is a mathematical concept which can vary with a real lens. My past testing has shown that different lenses at the same focal length and the same aperture can realize significantly different depth of field. This can be attributed to lens design, and also to lens aberrations such as chromatic aberration and spherical aberration. However, I believe that this is not a factor with the two lenses used in the comparison shots on this page. This phenomenon will be examined in a future article at diglloyd.com. The images were shot with the Canon 70-200/f2.8L IS @ 200mm (marked) and the Nikon 70-200/f2.8 VR at approximately 135mm zoomed to match the Canon. Focus was manual, near the topmost leaf of the foreground tree. The true focal lengths were probably slightly different than the marked values. The images were shot with identical exposures starting with 1/125 sec @ f5.6. However, the 1DsMII produced a much lighter image, so I reduced the exposure in DPP by 0.5 stops to have it better match the D2X exposure. The tonal range is still different, but it's a closer match. The images are the full frame as shot on each camera. The D2X images were upsampled to match the 1DsMII resolution (3328 wide). Then they were both downsampled to a smaller size (excepting the actual-pixel crops). While comparing cameras, it is hard to match the exact field of view between cameras. Please note that the D2X image in this example has a wider field of view-95% that of the 1DsMII image (I used full-sized images to determine this). An exact match for field of view would mean the D2X was at a focal length of 133mm. But my slight error means the D2X was shot at about 126mm. This gives the D2X image a bit more depth of field than an exact field-of-view match, but is not a factor which influences the conclusion. It is clear that the D2X has an substantial advantage with depth of field. While the whole picture looks sharp on the D2X, the 1DsMII simply cannot obtain enough depth of field to make a sharp picture; very little of the picture is as sharp. For that matter, even the D2X is challenged by this shot. The truth is that these cameras have such high resolution that the conventional depth of field calculations are simply way off the mark for what is actually required to fully utilize the phenomenal sensor resolution. Conventional depth of field tables generally use a "circle of confusion" of 20-30 microns (The circle of confusion or COC is the smallest dot that the lens can resolve at any given aperture). Compare the conventional 20-30 micron figure with the D2X 5.4-micron pixels and the 1DsMII 7.2-micron pixels, and it's clear that depth of field is extremely limited on either camera. Those depth of field marks on your lens are far beyond the actual depth of field. I hope you've enjoyed this article. The full review contains much more material on these wonderful cameras and is available on my web site diglloyd.com.